When Andy Matsui founded Matsui Nursery in 1967, he set out to make the world a more beautiful place. In 1998, he started the nation’s first orchid retail program and today it’s one of the world’s largest potted orchid growers. Through the sales of its orchids, the Matsui family supports organizations that serve and inspire people in the Salinas Valley and throughout Monterey County. The Matsui Foundation has supported education with over $8 million in scholarships for more than 240 students. 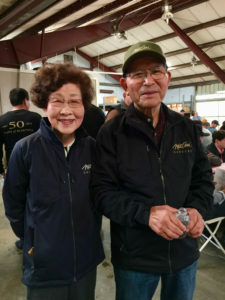 The Matsui family believe that equally important is the overall health of our community and have been a long-​​time member of The Agricultural Leadership Council in support of Natividad Foundation. In 2018, the Matsui family gave Natividad Foundation a transformative gift of $500,000 to create a new Infusion Center for cancer and chronic disease treatments at Natividad. The gift is the largest single donation received from an individual or family in the Foundation’s 30-​​year history. The donation is made in honor of Yasuko Matsui, who like her two daughters, is a breast cancer survivor. It provides funding for Natividad’s equipment needed to compound chemotherapy medications and non-​​oncologic treatments. The donation also funds a four-​​room infusion center at the medical center that will allow infusion therapy to be delivered in a physician-​​supervised outpatient setting. Once the initial projects are complete, the remainder of the donation will support Natividad’s continued expansion of infusion and chemotherapy services. Read more here. We are grateful for this generous family and their love for our community!